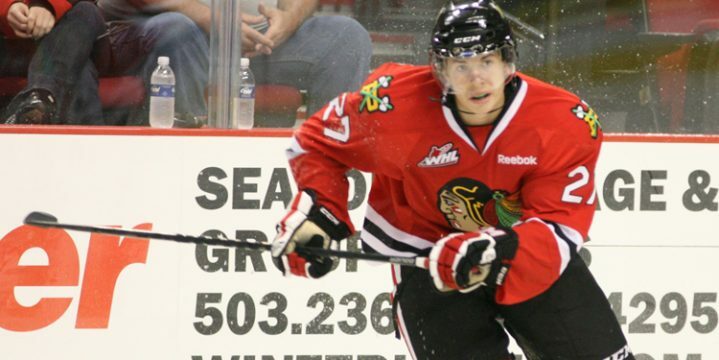 The Western Hockey League announced today that Portland Winterhawks forward Oliver Bjorkstrand is the WHL Player of the Month for February 2015. Bjorkstrand, a 19-year-old from Herning, Denmark, amassed 21 points (13g-8a) to go along with a plus-15 rating in nine games played during February. January’s reigning WHL Player of the Month, Bjorkstrand scored a goal in all nine games in February to lead the Winterhawks to a 6-1-2-0 record. Bjorkstrand recorded multiple-point outings on six occasions, including four occasions in which he scored multiple goals, and has scored a total of 18 goals over an 11-game goal scoring streak to tie a franchise record. Bjorkstrand’s performances in February saw him earn three first stars, two second star selections and one third star nod. The import forward’s efforts also helped Portland draw to within two points of the U.S. Division-leading Everett Silvertips while also clinching a playoff berth. The 6’0”, 168 lb forward sits second in WHL scoring with 91 points so far this season while Bjorkstrand’s 48 goals and plus-49 rating are league bests. Bjorkstrand is in his third WHL season with the Winterhawks and has tallied 263 points (129g-134a) in 183 career regular season contests. The Columbus Blue Jackets selected Bjorkstrand in the third round, 89th overall, of the 2013 NHL Draft. Bjorkstrand’s accomplishments make him a deserving choice as the WHL Player of the Month for February.